Yes, it’s only February, and teams haven’t even started spring practices yet. But with the 2019 recruiting cycle pretty much over for every team across the country, it’s time for some media outlets to start projecting what we could see in the college football world for the upcoming 2019 season. And according to one of the more well-known statistical models, Tennessee could be in store for a more impressive 2019 than many might expect. Bill Connelly of SB Nation is in charge of maintaining the S&P+ statistical rankings for college football teams. That model tries to analyze the true value of a team beyond just their win/loss record, and it does so by looking at their offensive and defensive efficiencies while also taking into account coaching value and the amount of talent on a team. For his preseason projections, the S&P+ takes into account three factors: recent history (the last 2-5 seasons), recruiting, and returning production. Once all those things were calculated and entered into the algorithm, Tennessee came out as a top 25 team in his very early S&P+ projections for the 2019 season. The Vols placed 21st in Connelly’s preliminary S&P+ rankings, coming in ahead of teams like UCF, USC, Stanford, and Texas. So why do the Vols, who finished last season with a 5-7 record, place so highly in the rankings? Connelly explains that it’s Tennessee’s large amount of returning production and fairly impressive recruiting haul that put them so high in the preseason listing. Connelly goes on to note that recruiting should never be a problem for a program like Tennessee, but that’s not the only reason the S&P+ likes the Vols heading into the 2019 season. Tennessee only lost 11 scholarship seniors off last year’s roster, and so far three players have transferred and one has declared early for the NFL Draft. But even with those departures, the Vols are still projected to return 80.9 percent of their passing yards, 76.6 percent of their rushing yards (assuming Jeremy Banks stays at linebacker), 98.1 percent of their receiving yards, and seven of their 10 top tacklers from 2018. That returning production and the boost from UT’s recruiting are the two main reasons why the Vols are rated so highly. Connelly also draws an interesting parallel between Jeremy Pruitt entering his second year at the helm of the Vols to Kirby Smart when he was heading into his second year with Georgia. The Bulldogs went 8-5 under Smart in his first year at UGA, but they ascended to impressive heights in 2017, winning the SEC and making it to the National Championship Game. While he doesn’t expect the Vols to make that type of jump, Connelly does think Pruitt and his team could be in line for an impressive step forward in 2019. “There’s an obvious parallel: Georgia was mediocre in Kirby Smart’s first year, then paired heavy returning production with great recruiting to enjoy a major second-year breakthrough in 2017,” Connelly states. “Tennessee is starting from a lot further behind. I’m doubting there’s a run to the national title game in the works. Not only have the Vols added a lot more talent to their roster both through recruiting and by adding transfers like Aubrey Solomon and Deangelo Gibbs, but Pruitt has also revamped his staff this offseason. Pruitt has hired Jim Chaney to serve as his offensive coordinator and has bolstered both his on-field coaching staff and his staff’s recruiting prowess by hiring Tee Martin and Derrick Ansley. There may be more moves still to come as well, but for now those are three big hires for a team that’s won a combined nine games over the last two seasons. Tennessee’s recruiting impact ranks 17th among the 130 FBS schools, and their returning production ranks 28th. Their recent history is unsurprisingly their worst score, placing 33rd. 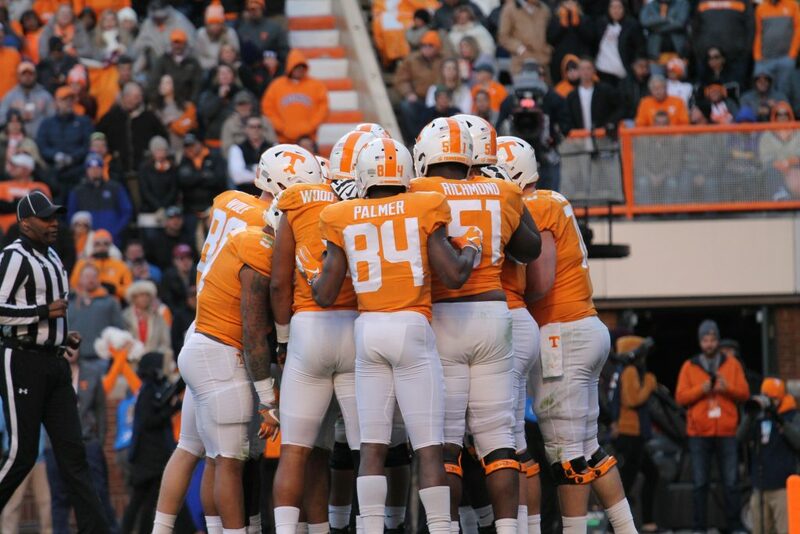 The Vols have gone 5-7, 4-8, 9-4, 9-4, and 7-6 over the last five seasons. The projected offensive and defensive S&P+ rankings for the 2019 season have Tennessee’s offense ranked well ahead of their defense. UT’s offense is projected to rank 13th while the defense is projected to be 49th. Do take all this with a grain of salt, however; not only is this still very, very early to try and predict the 2019 season, but Tennessee’s ranking in the S&P+ may not be quite as good as you would think at first glance. The Vols do come in at No. 21 in the projections, but that actually has them 10th in the SEC and only fifth in the Eastern division. Georgia (2nd), Florida (6th), Missouri (16th), and South Carolina (18th) all come in ahead of the Vols. Not only that, but the Vols will face four teams in the top 10 of the preliminary S&P+ rankings this upcoming season, and and eight of their 12 opponents rank inside the top 50 of the ratings. Vanderbilt comes in at No. 53 in the early rankings. It’s still far too early to tell how the Vols’ 2019 season will shape up, but these early preseason indications should provide some excitement and anticipation for Jeremy Pruitt’s second year as UT’s head coach.